Searching for Great Talent? We’ve Loads! 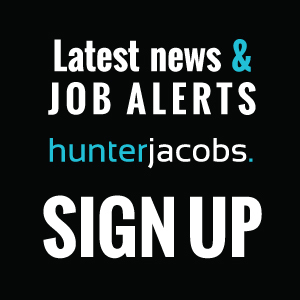 At Hunter Jacobs we are dedicated to helping our clients make the best possible hiring decisions. We work with you to define your goals and create a concise candidate profile and recruitment plan. We will take the time to truly understand your business, which allows us to present the opportunities within your company to the best candidates in the right way – how you would. Efficiency is at the core of everything we do and it is what we pride ourselves on. This will ensure you receive the best result in the shortest amount of time. We will keep you informed every step of the way. We acknowledge we are in a competitive industry. What sets us apart? Quite simply it is an unwavering commitment to finding the best candidates in the market place. Not the best candidates ON the market, the best candidates IN the market. That’s the difference. Our pledge to you is that your recruitment project is our absolute priority. Our work ethic is unrivalled and combined with our strong network, will ensure a successful completion of any assignment we undertake. We choose our clients carefully, if we don’t think we can effectively assist you, we will tell you, and refer you to an appropriate recruitment partner. We have the ability to find the best talent for your business with a speed and efficiency unheard of in our industry. Our search methods are bold and creative. Our network is large and powerful. We do the things that you would expect and more, and we do them well – we do not fuss about with useless activity and long drawn out pitches. We don’t waste your time with inappropriate candidates. Here at Hunter Jacobs – we get on with it. Not every business is the same and not every recruitment process is the same. We are flexible and adaptable and will fit in with how you like to work. No one understands better than us that “one size fits all” is a fallacy. Why are we the best choice for your business? We are working in your market every day. We know your clients, and we know your competitors. We are continually delving into the market and speaking with the best talent – every day. We are connected to the talent that you want to have within your business. As we have a particular strength within technology and professional services, we have a developed a strong knowledge base within this area. Partnering with us will ensure you are working with someone who understands what your business does. Our connections become your connections. Our network of top sales and executive talent has been built with care for many years. Many of our best candidates work with us exclusively, and will continue to do so for years to come. Our network casts a wider net than any job board, alumni network, newspaper ad or out of date database could ever hope to do. And you have access to it. How does the vacancy you have compare with similar level roles at your competitors? Are you offering the right level of salary for the role on offer? Our extensive market knowledge provides you with up to date information that is crucial to your hire. We will give you an honest and transparent evaluation of your vacancy. Every client we work with has a dedicated Account Manager, who will be their end to end recruiter. One point of contact. We will only take clients on board if we feel we can dedicate a full search capability to their project.